The Great Barrier Reef is a vast region – apart from being the world’s largest coral reef system, there are 900 fascinating islands here. A trip to the GBF requires a great deal of homework. There’s so much to see and do. We’ve put together a travel guide to help you plan your trip. If you want easy access to the GBF, take a flight to Cairns. From here, you can avail flights, buses and trains to north to Port Douglas which borders the GBF. Tourists enjoy driving on the Captain Cook Highway along the broken coastline to Port Douglas; this little town has white sand beaches and fabulous seafood restaurants. You can also take a cruise between Cairns and Townsville, and explore the GBF on your route. Another option to explore the Reef coastline is to rent a car, or grab one of the Greyhound Australia buses. 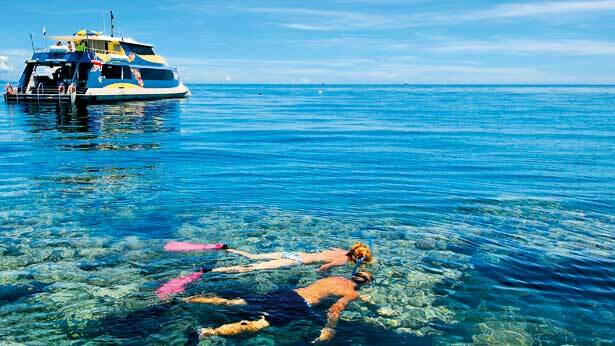 From Port Douglas, you can take only of the daily cruise and dive boats. These boats make stops at the outer and ribbon reefs so you can observe the rich coral and magnificent marine life. Some cruises also visit the Low Isles Reef, where there’s a small island with a lighthouse on it, and a fringe of brilliant coral surrounding it. It’s a great place to observe giant turtles. These cruises allow for off-board scuba dives and snorkeling side trips. Visit The GBF National Education Center here – it’s a good way for people to learn more about the Reef’s eco system and its marine life, before exploring the Reef itself. This education center in Townsville has over 130 coral and 120 fish species in its 2.5 million liter aquarium. There’s also a turtle hospital, where you can feed the turtles. Take a reef trip from Townsville to see the wreck of the SS Yongala, which sank in 1911. About 120 species of fish live in this sunken ship now. Take pictures of the coral gardens that riot on the continental island beaches. Several of these islands are great for snorkeling. Take day trips to Ribbon Reefs, Osprey Reef, Green Island, Upolu Cay, the horse-shoe shaped Eddy Reef and Dunk Island. Take a cruise from Cairns on a sailing catamaran to Michaelmas Cay and Paradise Reef. These are the best locations for adrenaline activities like snorkeling, scuba diving, sunbathing, glass bottom boat ride, sailing and so on. If you’re looking for island retreats, check out Hamilton Island, Bedarra Island, Pumpkin Island, and the Keppel Bay Islands. Here you’ll find beautiful self-catering cottages that overlook sparkling beaches. Take a reef trip to Knuckle ReefPontoon, which has an underwater viewing chamber and a giant waterslide.